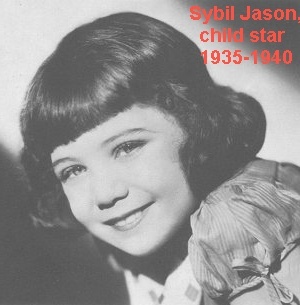 Celebrity Sybil Jason (real name Sybil Jacobson, was born on 23 Nov 1927 in Cape Town, South Africa & passed away on 23 Aug 2011 in Northridge, CA) was a popular child movie star actress from 1935-1940. 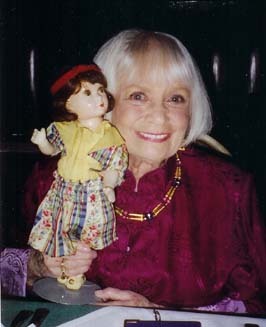 While we could find websites about the actress Sybil Jason and her career, we did not find any site that identified her dolls, so we made one. 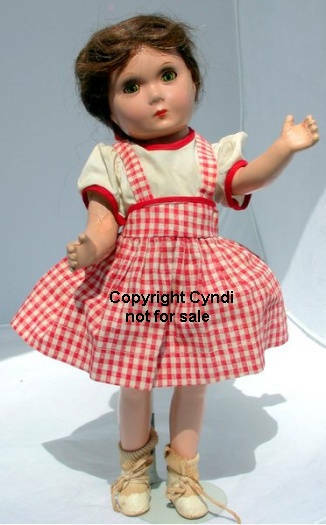 1935-1940s Sybil Jason celebrity dolls have been found in sizes 14 or 19" tall (other sizes may have been available), all composition jointed body with a human or mohair wig, painted tin sleep eyes, feathered eyebrows, real upper lashes, painted lower lashes, closed mouth, dolls are unmarked, clothing is unlabeled. It is unknown who actually produced these dolls. 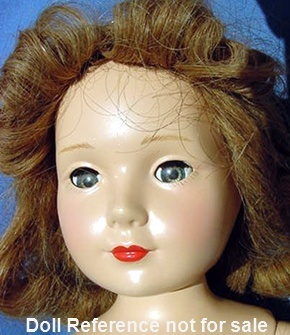 A doll shown in Mertz's Composition Doll book, Volume I, named a Stewardess doll is a Sybil Jason doll. This doll face mold is similar to the dolls designed by Dewees Cochran for Effanbee 1936-1939 called: American Children dolls, also made of all composition, but they have very different hands. Cochran's doll design had very detailed hands with separate spread apart fingers, while the dolls shown here have less detailed hands, with a separate thumb and the rest of the fingers together. Thanks to everyone who shared their expertise, photos, an knowledge to make this page possible.